Create a simple fabric book from scraps of cloth and hand sewn, or hole punched together while snacking on coffee, tea and cookies. Feel free to bring supplies and fabric from home. *Registration required. Touch some new textures. 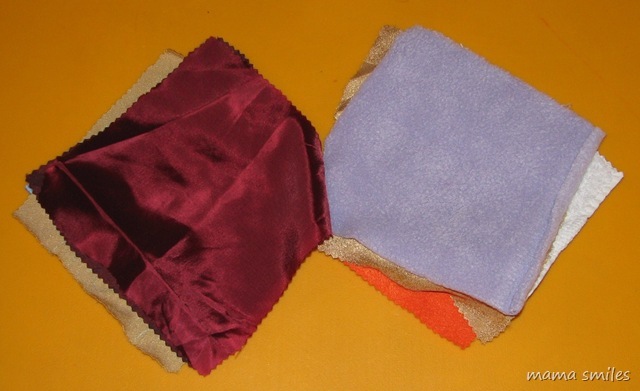 Gather together small squares of different fabrics (lace, cotton, corduroy, nylon, etc.). Snip a small hole through each square and tie them together with a piece of ribbon (they can also be stitched together at the corner as well). Let your baby touch the fabric “book” and talk about how the different textures feel. Do they have a favorite page?